A Details page is a landing page for an Entity or Document, for example Customers and Sales Orders have Details pages. You can access the Details pages Using the Lists or Recent Records on the side menu. The Details Page is generally divided into a Top Panel and Tabs. 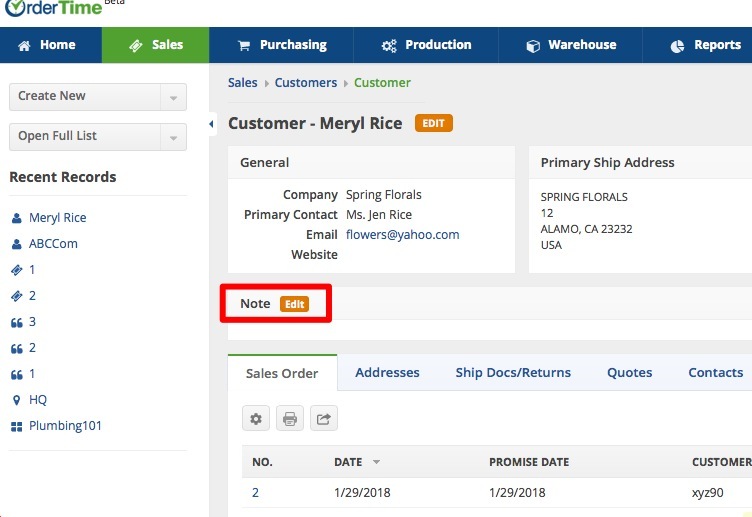 The Top Panel will show the general information about the selected record, while Tabs contain Properties (like Notes) or "Child Records" shown in a table. On certain Details pages, you will have the option to add a note to your transaction. Click on the Edit icon next to Notes to generate a note on your transaction. If needed, click on Date Stamp to insert current date and name of user writing the note. Click on Save when completed. Tabs act as the major source of navigation within Details pages. Tabs are found on the bottom half of the page and the available tabs will vary depending on which Details Page you are on.